Posted on November 8, 2018 at 5:57 am. We begin today with WOLF PACK PRIDE! There are a lot of AMAZING students here at WMS. And you deserve to be recognized! Teachers from every grade and every team have identified a distinguished group of students to receive this month’s Wolves With Character Award — for demonstrating outstanding RESPONSIBILITY in their daily lives. Just take a look at the screen to see all the deserving honorees from the 6th, 7th, and 8th grades. Congratulations, wolves with character! [clap] Be sure to stop by room 110 during your grade-level lunch TODAY and pick up your free pizza! The 1st quarter is officially OVER, and you know what that means — it’s almost time for the 1st quarter WOLF PAW DRAWING! That’s right — this FRIDAY during WOLF TIME, YOU could be the winner of some amazing gifts and prizes. They’re all on display in the library showcase, so come take a look. But to be eligible, you must turn-in your Wolf Paws TODAY to the grade level boxes located by the cafeteria. Again, TODAY is your last chance to submit your Paws before the drawing, which will be held TOMORROW during TA. Good luck, wolves!! And now for an important announcement from our school librarians! Do you have any OVERDUE LIBRARY BOOKS??? If you checked out a book from the school library in September or October — then it’s probably about time to turn it back in. Teachers will be passing out overdue notices in TA today — and students are asked to PLEASE look in your lockers and at home for any long lost library books. Calling all MUNners! The WMS Model UN Club will be holding an important meeting TODAY during ASP 1 in room 202. Participants will be strategizing for the upcoming GWMUN — AND will start planning for the annual WOLFMUN right here at WMS. See Ms. Carlson with any questions. Attention all students in the Art ACT 2 class — today’s class has been CANCELLED. Again, there will be NO Art ACT 2 after school today. See Mr. Skrzypek with any questions. Who’s hungry?! The WMS Symphony Club will be holding a bake sale TOMORROW after school — in the main lobby and by the cafeteria. Students can choose from an assortment of yummy snacks — all for just a buck or two. Profits will help the club pay for new sheet music. So get some goodies before they’re gone! And speaking of the Bake Sale, Symphony Club members are reminded to BRING IN YOUR BAKED GOODS! Just drop them off in Ms. Tuttle’s room — C105 — tomorrow morning. Don’t forget! And finally today — How would YOU like to be featured in a new segment on WOLF-TV? 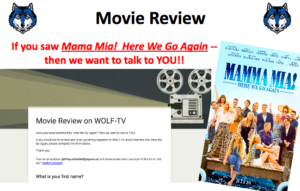 It’s a “Movie Review” show — and we’re looking for any students OR staff who have seen the movie: Mama Mia! Here We Go Again! If you’ve seen it, just go to the Morning Announcements Blog on the WMS website and complete the online form. Then we’ll contact you soon to schedule an interview — and YOU could be on TV! MAMA MIA! !